This is an aggressively priced 6" quickdraw, built with an 10 mm Quick Link, a Steel Gym Carabiner with a captured eye, and a burly, double-layered, ¾" nylon sling for maximum durability. The Steel Gym Carabiner has a wire gate and a captured eye. Use it with or without the removable pin. The 10 mm Steel Quick Link is aggressively priced, making it a great leaver 'biner. It is perfect for fixed quickdraws and anchors. Our super-durable gym 'draws now available in five sizes: 6"/9"/12"/15"/18". Available in 4 s.k.u. specific colors: yellow, blue, red, black. 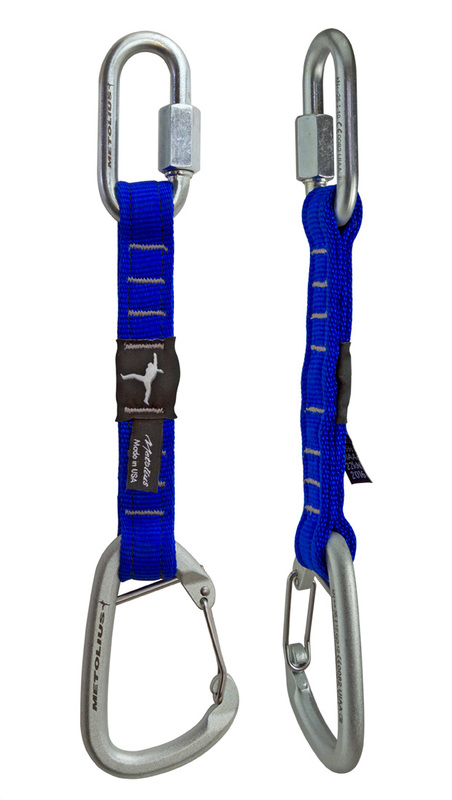 These slings are custom ordered, please contact customer service to place order info@metoliusclimbing.com.